The Aten KM0532 is a 32 port, 5 user Matrix KVM Switch which gives IT administrators in large corporations advanced access and control of multiple servers. Operators working at up to 5 consoles can assume simultaneous and independent control of 32 directly connected, or through a combination of daisy chaining and cascading, as many as 8000 computers. 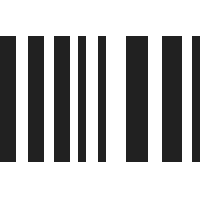 A special feature will allow two KM0532 to be connected together in a way that allows 10 simultaneous operators independent access to 64 attached servers. A dual power supply connected to different electrical circuits ensures continued operation in the event of a power failure on one circuit. The KM0532 allows for real time port control by an administrator over an RS232 connection. Close an operators session, switch ports, or end an operator's connection to a port without closing the user's session. Server access and control is easily accomplished by means of a convenient, intuitive, graphical user interface. In addition, once the initial network setup has been accomplished, server administration tasks may be managed over the internet or through your local network by using any web browser. Embedded web interface for easy system configuration. 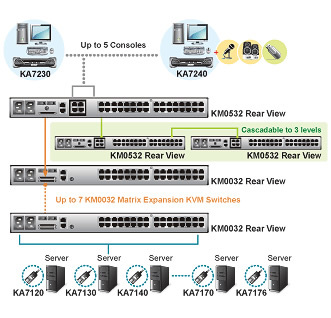 Dual Root functionality allows you to expand your top-level KM0532 deployment to 10 consoles. RS-232 port permits an administrator user logged in over the port to perform Console and KVM port access and control. Rubber feet for desktop use. Answer: Hi Walter, thank you for your Inquiry. Aten will ship you the Rackmount Kit for the KM0532 for free - they don't have disparate retail SKUs for Rackmount Kits. Please contact sales@aten-usa.com to setup the order and provide shipping information. Question: We currently have a KVM SWITCH: SMB CAT5 216 232 SWITCH W (32) BELKIN OMNIVIEW PN: F1DP232A-BU. Is the Aten switch compatible? Can we daisy chain to the Belkin switch? Belkin OmniView daisy-chaining is only possible with other switches in that series - Belkin and Aten switches are not naitively cross-compatible. That being said, you could always plug in the output signals of one KVM into a input port of the other - this would let you access the first KVM from the second, but the switching controls may be messy.. Question: How many local user connections does this switch support? Answer: Thank you for your inquiry. This switch does not support any direct connections for a local user. Each of the 5 consoles requires a console module (either a KA7230: https://www.kvm-switches-online.com/ka7230.html or KA7240: https://www.kvm-switches-online.com/ka7240.html ), and each module would connect to the switch via CAT5e/CAT6 cable. So, technically it supports up to 5 (extended) local consoles, but not out of the box and not right at the switch. One other item to note, the browser connection on this device is strictly for administrative functions and not actually controlling any targets.